Market actors include individual retail investors, mutual funds, banks, insurance companies, hedge funds, and corporations. Pension funds are important shareholders of listed and private companies. Insurance companies are generally classified as either mutual or proprietary companies. A mutual fund is a type of professionally-managed collective investment vehicle that pools money from many investors to purchase securities. An index fund or index tracker is a collective investment scheme (usually a mutual fund or exchange -traded fund) that aims to replicate the movements of an index of a specific financial market, or a set of rules of ownership that are held constant, regardless of market conditions. A hedge fund is an fund that can undertake a wider range of investment and trading activities than other funds. It is generally only open to certain types of investors specified by regulators. open-end: An open-end(ed) fund is a collective investment scheme which can issue and redeem shares at any time. closed-end: Closed-end funds (or closed-ended funds) are mutual funds with a fixed number of shares (or units). Unlike open-end funds, new shares/units are not created by managers, to meet demand from investors, but the shares can only be purchased (and sold) in the market. The individual actors in the financial markets can be broken down into three main categories: investors, intermediaries, and issuers. Specifically, market actors include individual retail investors, institutional investors such as mutual funds, banks, insurance companies and hedge funds, and also publicly traded corporations trading in their own shares. The value of a stock is derived from buying and selling decisions of these actors. Some studies have suggested that institutional investors and corporations trading in their own shares generally receive higher risk-adjusted returns than retail investors. Stock Market: Different kinds of investors are active in stock market. An investor is someone who allocates capital with the expectation of a financial return. The types of investments include, — equity, debt securities, real estate, currency, commodity, derivatives such as put and call options, etc. A few decades ago, worldwide, buyers and sellers were individual investors, such as wealthy businessmen, usually with long family histories to particular corporations. Over time, markets have become more “institutionalized. ” Buyers and sellers are largely institutions. Investors can include: pension funds, insurance companies, mutual funds, index funds, exchange-traded funds, and hedge funds. The issuer is a legal entity that develops, registers, and sells securities for the purpose of financing its operations. Issuers may be domestic or foreign governments, corporations, or investment trusts. Financial institutions (intermediaries) perform the vital role of bringing together those economic agents with surplus funds who want to lend, with those with a shortage of funds who want to borrow. The classic example of a financial intermediary is a bank that consolidates bank deposits and uses the funds to transform them into bank loans. Other classes of intermediaries include: credit unions, financial advisers or brokers, collective investment schemes, and pension funds. A pension fund is any plan, fund, or scheme that provides retirement income. Pension funds are important shareholders of listed and private companies. They are especially important to the stock market where large institutional investors dominate. The largest 300 pension funds collectively hold about $6 trillion in assets. In January 2008, The Economist reported that Morgan Stanley estimates that pension funds worldwide hold over $20 trillion in assets, the largest for any category of investor ahead of mutual funds, insurance companies, currency reserves, sovereign wealth funds, hedge funds, or private equity. A mutual fund is a type of professionally-managed collective investment vehicle that pools money from many investors to purchase securities. While there is no legal definition of mutual fund, the term is most commonly applied only to those collective investment vehicles that are regulated, available to the general public, and open-ended in nature. Hedge funds are not considered a type of mutual fund. There are three types of U.S. mutual funds: open-end, unit investment trust, and closed-end. The most common type, the open-end mutual fund, must be willing to buy back its shares from its investors at the end of every business day. Exchange-traded funds are open-end funds or unit investment trusts that trade on an exchange. Open-end funds are most common, but exchange-traded funds have been gaining in popularity. An index fund or index tracker is a collective investment scheme (usually a mutual fund or exchange-traded fund) that aims to replicate the movements of an index of a specific financial market, or a set of rules of ownership that are held constant, regardless of market conditions. As of 2007, index funds made up over 11% of equity mutual fund assets in the United States. An exchange-traded fund (ETF) is an investment fund traded on stock exchanges, much like stocks. An ETF holds assets such as stocks, commodities, or bonds, and trades close to its net asset value over the course of the trading day. Most ETFs track an index, such as a stock index or bond index. ETFs may be attractive as investments because of their low costs, tax efficiency, and stock-like features. ETFs are the most popular type of exchange-traded product. A hedge fund is an fund that can undertake a wider range of investment and trading activities than other funds. It is generally only open to certain types of investors specified by regulators. These investors are typically institutions, such as pension funds, university endowments and foundations, or high-net-worth individuals, who are considered to have the knowledge or resources to understand the nature of the funds. As a class, hedge funds invest in a diverse range of assets, but they most commonly trade liquid securities on public markets. They also employ a wide variety of investment strategies, and make use of techniques such as short selling and leverage. The New York Stock Exchange is the world’s largest stock exchange by market capitalization at $14.242 trillion as of December 2011. The origin of the NYSE can be traced to May 17, 1792, when the Buttonwood Agreement was signed by 24 stockbrokers outside of 68 Wall Street in New York under a buttonwood tree on Wall Street. The New York Stock Exchange (sometimes referred to as “the Big Board”) provides a means for buyers and sellers to trade shares of stock in companies registered for public trading. The New York Stock Exchange is open for trading Monday through Friday from 9:30 am to 4:00 pm ET, with the exception of holidays declared by the NYSE in advance. Traders can gather around the appropriate post. There, a specialist broker acts as an auctioneer in an open outcry auction market environment to bring buyers and sellers together and to manage the actual auction. To be listed on the New York Stock Exchange, a company must have issued at least a million shares of stock worth $100 million and must have earned more than $10 million over the last three years. secondary market: The financial market in which previously issued financial instruments such as stock, bonds, options, and futures are bought and sold. NASDAQ: The National Association of Securities Dealers Automated Quotations; this is an electronic stock market. 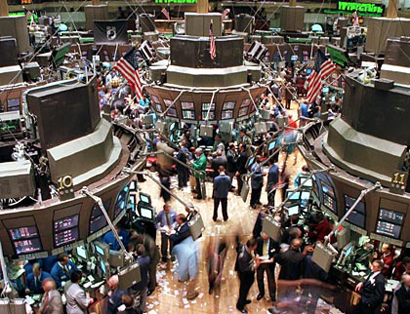 The New York Stock Exchange, commonly referred to as the NYSE, is a stock exchange, or a secondary market. With primary issuances of securities or financial instruments, or the primary market, investors purchase these securities directly from issuers such as corporations issuing shares in an IPO or private placement, or directly from the federal government in the case of treasuries. After the initial issuance, investors can purchase from other investors in secondary markets like the NYSE. If an investor wished to buy a stock from Apple, for example, the actual company is not directly involved. Secondary markets can be further subdivided into auction or dealer markets, typified by the mode of transactions. The NYSE is an auction market. Buyers and sellers meet at a physical location (in this case, Wall Street) and announce their bid or ask prices. At the NYSE, traders gather around a specialist broker, who acts as an auctioneer in an open outcry auction market environment to bring buyers and sellers together and to manage the actual auction. The auction market format aims to bring together the parties with mutually agreeing prices in an efficient manner. The auction process moved toward automation in 1995 through the use of wireless hand held computers (HHC). The system enabled traders to receive and execute orders electronically via wireless transmission. NYSE Trading Floor: Buyers and sellers meet and engage in face-to-face transactions at the NYSE, which is an auction-style secondary market. The NYSE is by far the world’s largest stock exchange by market capitalization of its listed companies at $14.242 trillion as of December 2011, and most of the largest US companies are listed on the NYSE. The NYSE’s biggest competitor is NASDAQ; both are major secondary markets vying for large and profitable companies to list on their exchange. Secondary markets like the NYSE serve a vital function as a setting where companies can raise capital for expansion through selling shares to the investing public. They also gain advertising and a boost in prestige, which likely increases their stock value. To be able to trade a security on the NYSE, it must be listed. To be listed on the New York Stock Exchange, a company must have issued at least a million shares of stock worth $100 million and must have earned more than $10 million over the last three years. They must also disclose certain information to the exchange, providing a measure of transparency that prevents insider manipulation of the stock prices. The NASDAQ is an American dealer-based stock market in which the dealers sell electronically to investors or firms. NASDAQ was founded in 1971 by the National Association of Securities Dealers (NASD), who divested themselves of it in a series of sales in 2000 and 2001. NASDAQ quotes are available at three levels: Level 1 shows the highest bid and lowest offer; Level 2 shows all public quotes of market makers; Level 3 is used by the market makers and allows them to enter their quotes and execute orders. NASDAQ has a pre-market session from 7:00am to 9:30am, a normal trading session from 9:30am to 4:00pm, and a post-market session from 4:00pm to 8:00pm (all times in ET). Three market tiers are NASDAQ Capital Market – Small Cap, NASDAQ Global Market – Mid Cap, NASDAQ Global Select Market – Large Cap. FINRA: In the United States, the Financial Industry Regulatory Authority, Inc., or FINRA, is a private corporation that acts as a self-regulatory organization (SRO). FINRA is the successor to the National Association of Securities Dealers, Inc. (NASD). Though sometimes mistaken for a government agency, it is a non-governmental organization that performs financial regulation of member brokerage firms and exchange markets. The government organization which acts as the ultimate regulator of the securities industry, including FINRA, is the Securities and Exchange Commission. The NASDAQ Stock Market, also known simply as the NASDAQ, is an American stock exchange. “NASDAQ” originally stood for “National Association of Securities Dealers Automated Quotations. ” It is one of the largest stock exchanges in the world along with the New York Stock Exchange. 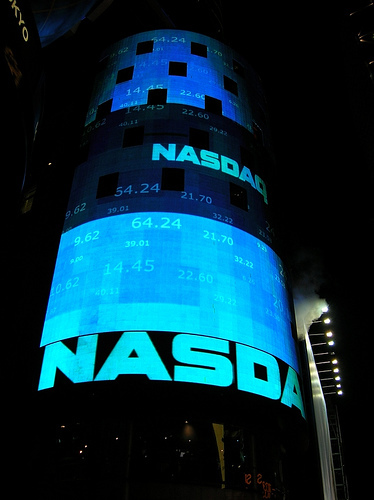 NASDAQ: NASDAQ is the second-largest stock exchange market in the world, as of 2012. The NASDAQ is a dealer-based market in which stock dealers sell directly to investors or firms electronically via phone or Internet. The New York Stock Exchange conducts its trading in person. NASDAQ was founded in 1971 by the National Association of Securities Dealers (NASD), who divested themselves of it in a series of sales in 2000 and 2001. It is owned and operated by the NASDAQ OMX Group and regulated by the Financial Industry Regulatory Authority (FINRA), the successor to the NASD. When the NASDAQ stock exchange began trading on February 8, 1971, it was the world’s first electronic stock market. At first, it was merely a computer bulletin board system and did not actually connect buyers and sellers. The NASDAQ helped lower the spread (the difference between the bid price and the ask price of the stock), but paradoxically was unpopular among brokerages because they made much of their money on the spread. Firms including Microsoft began doing business through NASDAQ early in their history, and remained with this exchange as the technology industry boomed. NASDAQ became known for its concentration of tech and high-growth firms, making it the primary tech market and an indicator for industry trends. The NASDAQ Composite is often referred to as the NASDAQ. It is calculated from weighting common stocks and similar securities listed on the NASDAQ stock market. Thus “NASDAQ” can mean two things: either the stock exchange itself, or the index. Market indices provide valuable information for stock valuation. The is a tool used by investors and financial managers to describe the market and to compare the return on specific investments. An index is a mathematical construct, so it may not be invested in directly. A ‘world’ or ‘global’ stock market index includes (typically large) companies without regard for where they are domiciled or traded. A ‘national’ index represents the performance of the stock market of a given nation—and by proxy, reflects investor sentiment on the state of its economy. 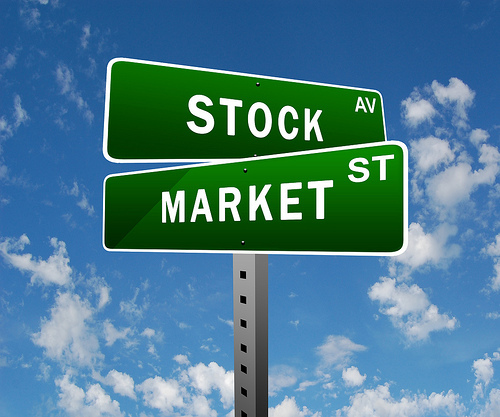 Stock market indices provide invaluable information for investors and accountants. weighted average: An arithmetic mean of values biased according to agreed weightings. Common stock: Shares of an ownership interest in the equity of a corporation or other entity with limited liability. Holders of this type of stock are entitled to dividends. Importantly, the financial rights for holders of this type of stock are junior to preferred stock and liabilities. market capitalization: The total market value of the equity in a publicly traded entity. A stock index or stock market index is a method of measuring the value of a section of the stock market. It is computed from the prices of selected stocks (sometimes a weighted average). It is a tool used by investors and financial managers to describe the market and to compare the return on specific investments. 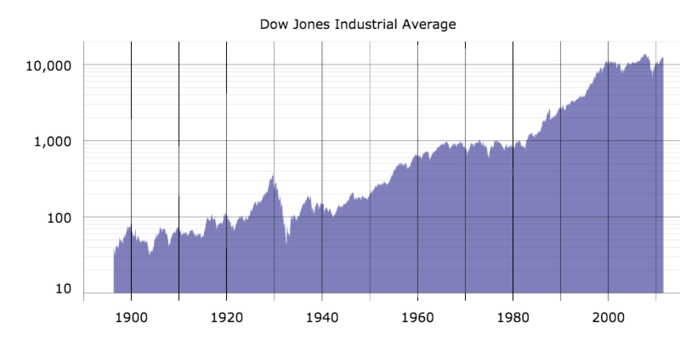 Historical Graph of the Dow Jones Industrial Average: This graph shows the general increase in the DJIA over the last century. Particularly notable is the growth from around 1,000 points in the late 1980s to around 10,000 points in 2005. An index is a mathematical construct, so it may not be invested in directly. Many mutual funds and exchange -traded funds attempt to “track” an index. The funds that do may not be judged against those that do. Stock market indices may be classed in many ways. A ‘world’ or ‘global’ stock market index includes (typically large) companies without regard for where they are domiciled or traded. Two examples are MSCI World and S&P Global 100. A ‘national’ index represents the performance of the stock market of a given nation—and by proxy, reflects investor sentiment on the state of its economy. The most regularly quoted market indices are national indices composed of the stocks of large companies listed on a nation’s largest stock exchanges, such as the American S&P 500, the Japanese Nikkei 225, the Brazilian Ibovespa, the Russian RTSI, the Indian SENSEX, and the British FTSE 100. By comparing the above ratios with those of other companies, investors, accountants, and forecasters can determine the position and health of their respective company’s stock.